I have a new home builder that wants to treat the framed houses because he did not do a pretreatment. is this effective? As far as a preventive treatment, a complete treatment under the surface area of the house is the standard. This includes spraying all of the soil and creating a chemical "barrier" between the house foundation and the soil. Treatment of anything less than this is not considered a "pre-treatment" but is considered a "post-treatment". 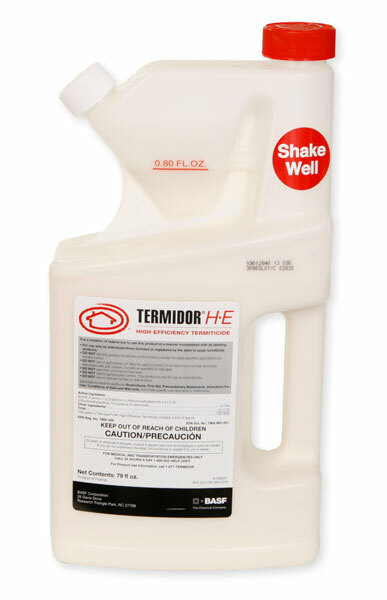 Treating only the outside foundation of the house using Termidor can control them, however much depends on the actual construction of the home and the final landscaping after construction. Treatment of the wood inside the house would have to be performed using Bora Care and not Termidor. This can also be beneficial, but has to be performed BEFORE any sheetrock has been installed. Treatment of the sill plates and studs up to about 3 feet from the foundation floor is the standard. Also most companies use a green or blue DYE that indicates where the treatment is applied. So basically, to answer your question, it can work but instead of treating 100% of the soil below the foundation, treatment of the exterior foundation only ( less than 5% of the total soil ) is better than nothing at all and the only treatment that can be made after construction is complete.